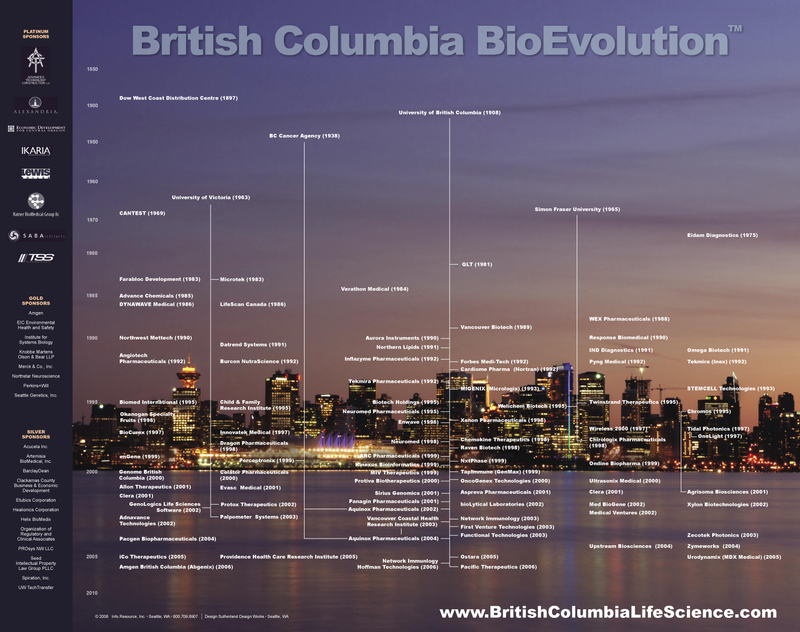 We invite you to explore British Columbia Life Science BioEvolution, 2008, a one-of-a-kind image that illustrated the founding technology originsmore than 100 life science companies located in the province. Specifically, the origins of the companies' founding technology with the province's universities and non-profit research organizations -- longstanding centers of innovation, technology transfer and job creation. The newly updated British Columbia Life Science Genealogy and other state and province posters will be made available in high-resolution digital and printed formats for distribution throughout the U.S. and Canada in 2019. Information about sponsorship opportunities will soon be available. We extend a special thank you to the many companies and organizations that sponsored our 2006 British Columbia BioGenealogy poster, including Alexandria Real Estate, Amgen, BioLife Solutions, Economic Development For Central Oregon, Ikaria, Lease Crutcher Lewis, Merck & Co., Ratner BioMedical, SAB Architects, Technical Safety Services, and others. British Columbia BioEvolution 2008 . British Columbia Life Science Genealogy 2019 © Info.Resource, Inc.